Guest blog post by Robert D. Strain, President, Ball Aerospace &Technologies Corp.
We were pleased to host U.S. Secretary of Commerce Penny Pritzker on the first stop of her nationwide listening tour. As a leading manufacturer, Ball appreciated the opportunity to share our perspectives on how to strengthen American businesses with Secretary Pritzker. Ball has recently made significant investments in its manufacturing facilities including an investment in its spacecraft manufacturing center and an expansion of the company’s metal beverage manufacturing plant in Golden, CO. The Secretary’s tour of our Boulder, CO facilities gave us the opportunity to highlight those investments. Dialogue between the government and industry is an important part of encouraging the conditions necessary for business growth. 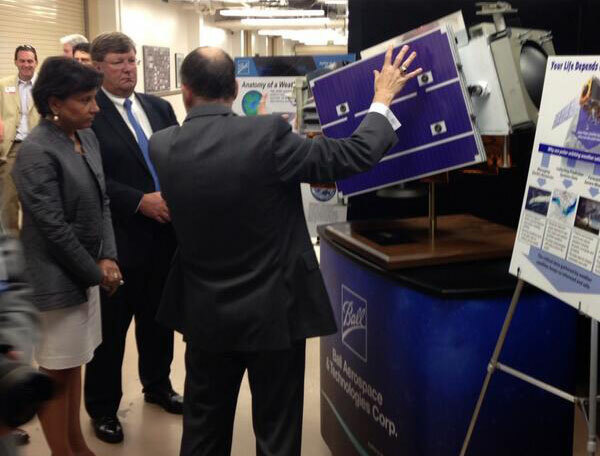 Secretary Pritzker’s visit also provided an opportunity to call attention to the role that Commerce’s National Oceanic and Atmospheric Administration (NOAA) plays in a significant element of our national infrastructure—our weather prediction capability. The Ball-built Suomi National Polar-orbiting Partnership (S-NPP) weather satellite is operational and is the first of NOAA’s new generation of weather satellites and instruments. This new system is dramatically increasing our nation's weather forecasting capabilities. Ball is now building the Joint Polar Satellite System (JPSS)-1 spacecraft and the Ozone Mapping and Profiler Suite instrument on behalf of NOAA. The Secretary was able to view the spacecraft in development and see that the program is on schedule and is meetings its cost objectives. The nation’s weather satellites are the backbone of our weather prediction capability. Polar orbiting weather satellites, like S-NPP and JPSS, provide critical data over the world's land masses and oceans. The ability to forecast weather, across the globe, has significant implications for commerce and national security. The nation’s weather satellites allow meteorologists to accurately forecast where and when storms will hit. Advanced warning of severe weather limits economic damage and save lives. In addition to their life-saving role in predicting severe weather, NOAA’s weather satellites provide industries the valuable information they need. Satellites provide advance drought forecasts for farming, transportation, tourism, and energy sectors. Ball is proud to play an important role in the development of these vital systems. I’d like to thank Secretary Pritzker for initiating the valuable discussion between the Department of Commerce and U.S. businesses and appreciate her willingness to engage with Colorado business leaders on ways to foster economic prosperity.